los tres deseos de siempre Carlos Aguirre Grupo 0:00'14"
Fix The Stars Girl With The Gun 0:05'43"
"Ma-Ma" FC Ballake Sissoko / Vincent Segal 0:13'05"
Portrait For Frazer The Durutti Column 0:18'12"
San Solomon / Balmorhea V.A. (Chill-Out Mellow Beats〜Harmonie du soir) 0:21'38"
SERAS VERDAD? / QUIQUE SINESI V.A. 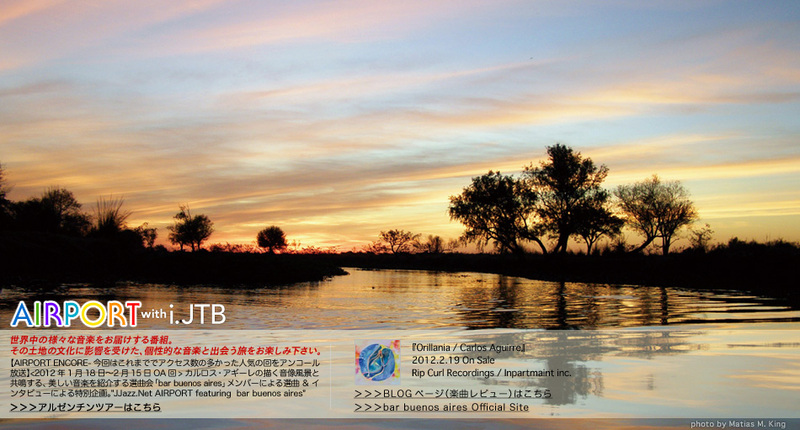 (Bar Buenos Aires -Dedicated To Carlos Aguirre) 0:24'32"
HIROSHI / CARLOS AGUIRRE (ボーナストラック) V.A. (Bar Buenos Aires -Dedicated To Carlos Aguirre) 0:48'57"
至福なる君 Jose Antonio Mendez 0:53'42"
Alesund Sun Kil Moon 0:56'38"
Cancion / Cecilia Elias V.A. （美しき音楽のある風景〜素晴らしきメランコリーのアルゼンチン） 1:03'03"